GeReLeC offers a professional service in under tile heating and insulation for your home or office. With our Under Tile Heating System the heat rises gently throughout the room, delivering the heat directly to the living area with minimum heat loss. 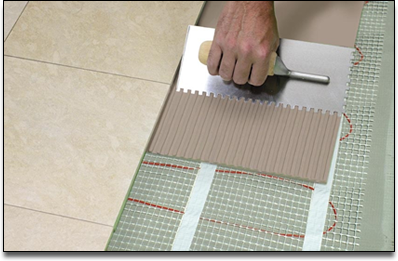 As Underfloor Heating Specialists we supply and install the full under tile heating system for your home or office. 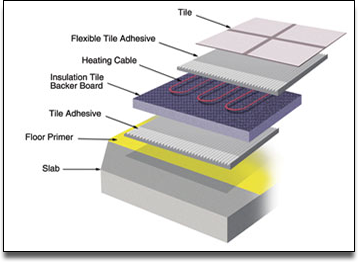 TILE TYPES SUITABLE FOR UNDER TILE HEATING: Ceramic Tiles, Porcelain Tiles, Marble Tiles and Slate Tiles. ECONOMICAL: Our under tile heating system is effective within 30 minutes of switch-on. You can heat the area that you need, when you need it. To give you an idea of the economy of our underfloor heating system, a UT275 (275 Watts) undertile heater uses less power than three 100 watt light bulbs. SAFE: Our undertile heaters are safety tested and are completely waterproof. It is encased in a tough "ETFE" insulation which is mechanically tough, excellent dielectric strength, and resistant to alkali chemical attack in concrete. UNOBSTRUSIVE: Discreetly hidden from view, this wafer-thin heater lies hidden directly under the tiles. There are no visible elements or radiators. No summertime storage problems. 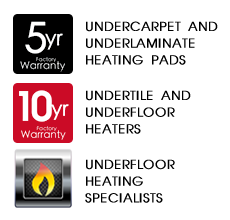 A 10 year factory-backed warranty is provided. Warranty forms are issued with each heater.